Laughing owl. Adult perched in treefern. Wellington region. Image © No known copyright restrictions by Henry Wright Photographed (in the Wellington Region?) between 1889 and 1910 by Henry Charles Clarke Wright (1844-1936). 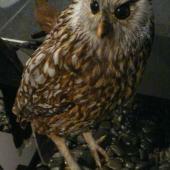 Trevor Worthy has stated that the photo is of a bird that was held in captivity by Walter Buller. 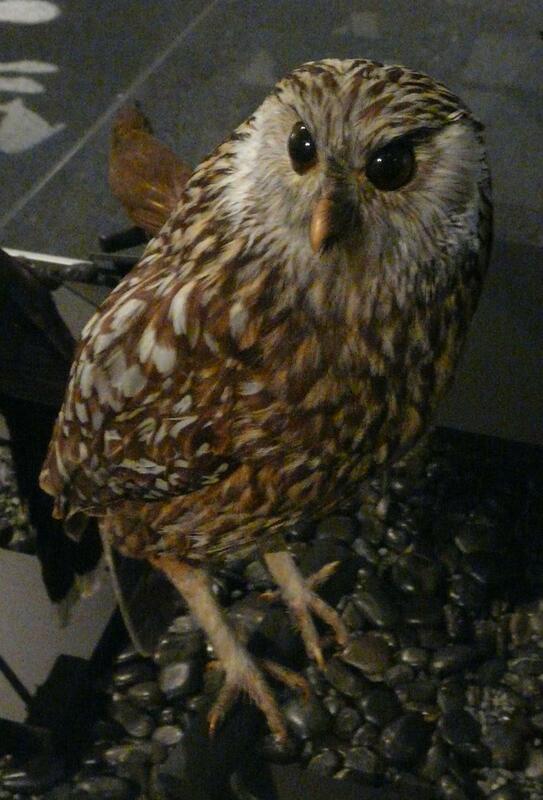 The laughing owl was originally placed in the monotypic genus Sceloglaux, but recent genetic analysis showed that it is nested within the genus Ninox and the authors recommended that it be referred to as Ninox albifacies. This recommendation is under consideration by the Birds New Zealand Checklist Committee. 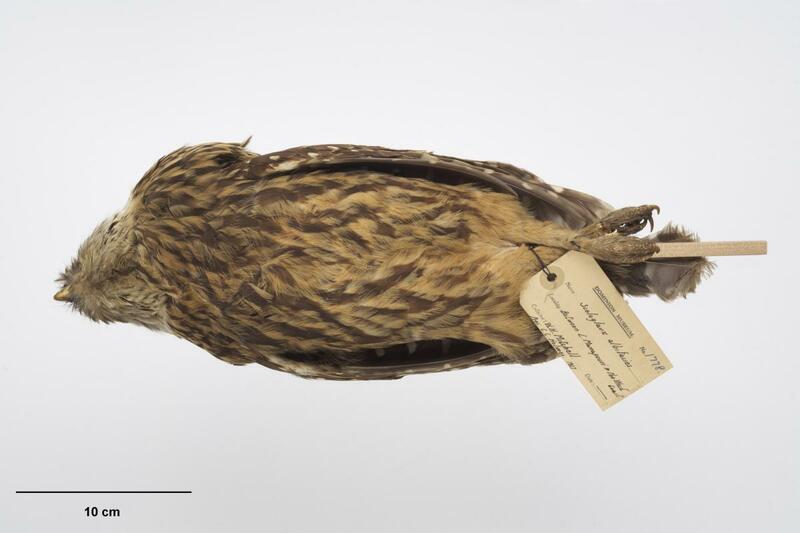 The common name of the laughing owl referred to its call, described by a contemporary naturalist as a “loud cry made up of a series of dismal shrieks frequently repeated.” The birds were still common in the South Island in the mid-1800s, but declined rapidly thereafter. 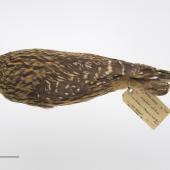 The last confirmed record was a dead specimen from South Canterbury found in 1914, but sight and sound records continued to be reported from both islands into the 1930s. 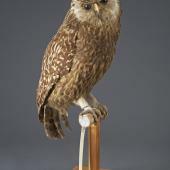 Laughing owls coexisted with early European settlement, but the introduction of stoats, ferrets, and weasels is thought to have led to their extinction. Laughing owls were about twice the size of a morepork. 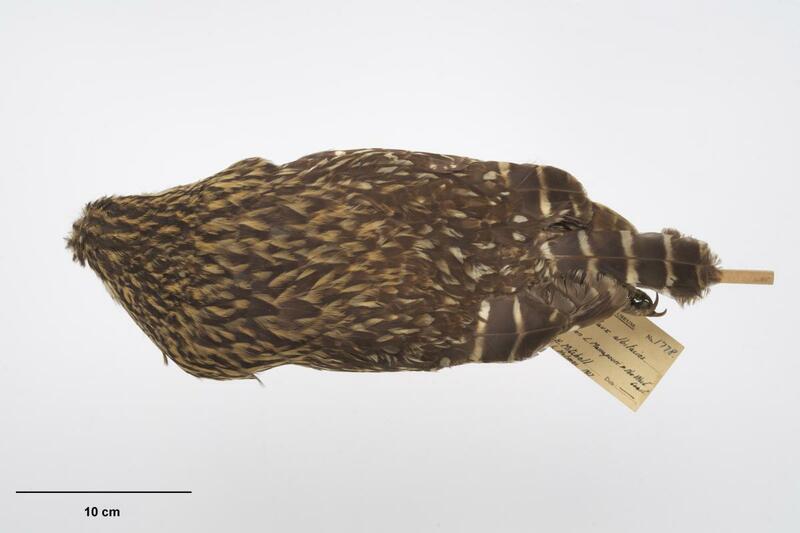 Adults were dark brown above with buff-yellow longitudinal stripes; each feather had a brown centre almost to the tip and a broad buff-yellow edge. The underparts were yellowish-brown to buff, prominently streaked with dark brown or reddish-brown. The wings and tail were brown with paler bars. The legs were covered to the toes with bristly pale yellow feathers. 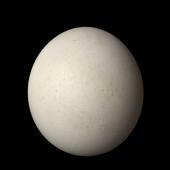 The facial disk was pale apart from thin, dark brown shaft-streaks. Newly hatched young were sparsely covered with coarse, yellowish-white down. Voice: a loud and varied repertoire included “doleful shrieks”, a “prolonged cack-cack-cack” which was reportedly repeated incessantly on rainy nights, a call similar to “two men cooeying to each other over a distance” given by a captive pair at dusk, and a barking noise “just like the yelping of a young dog”. 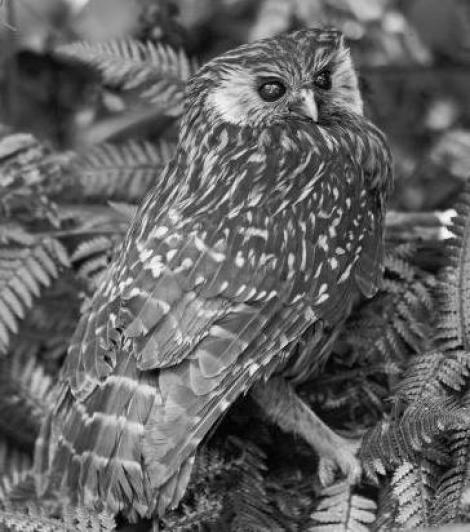 Similar species: morepork is half the size and much darker, especially on the face and underparts. Barn owl is much paler, almost white underneath. 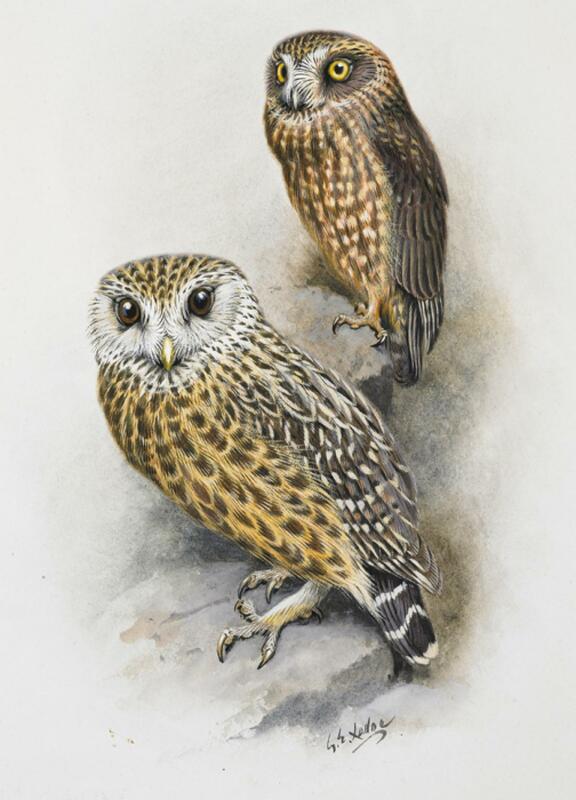 Originally found throughout New Zealand, but by the time Europeans arrived laughing owls were only recorded south of a line from Taranaki to East Cape in the North Island, and in Nelson, Marlborough, east of the main divide in the South Island, and on Stewart Island. 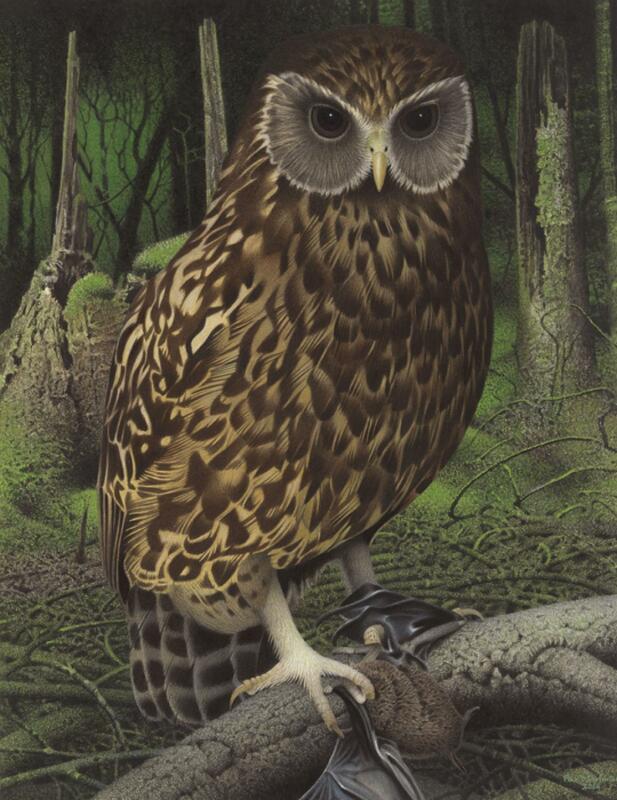 Laughing owls lived in both open country and forested areas. They roosted in caves or fissures in rock faces and on rock ledges. 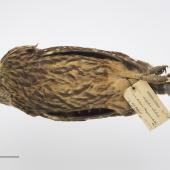 Laughing owls may have been declining in the North Island before major European settlement, but were reportedly common in the Urewera Ranges in pre-European times. 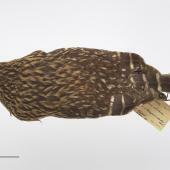 Only two specimens were collected from the North Island, both of which are now lost. They were common in the South Island in the mid-1800s, but thereafter declined rapidly. 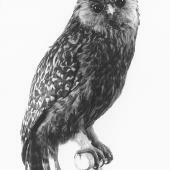 The last reported specimen was collected in 1914, and they were probably extinct by 1940. 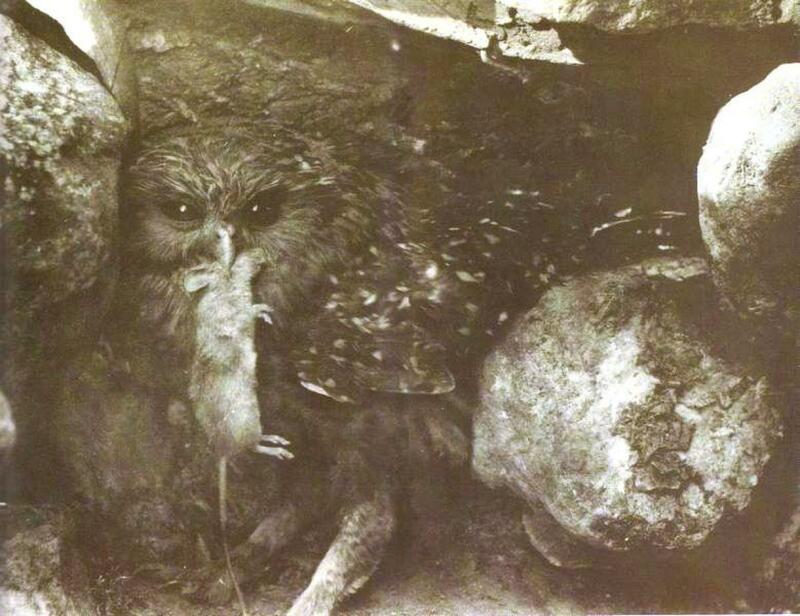 The introduced Pacific rat or kiore (Rattus exulans) formed an important part of the owl’s diet following Polynesian arrival, and is unlikely to have contributed to the owl’s decline as they coexisted for hundreds of years in the South Island. 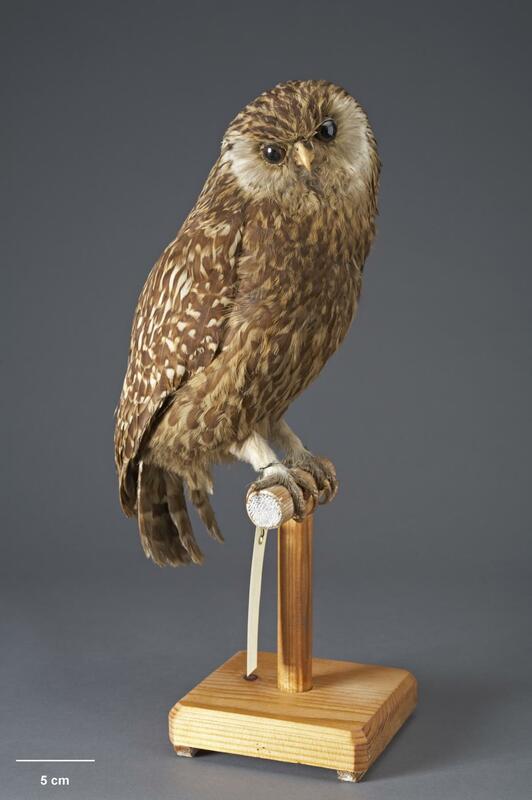 The rapid decline to extinction of the laughing owl has been attributed to the introduction of stoats, ferrets, and weasels to control rabbits in the 1880s. The nest consisted of dried grasses placed directly on the ground in caves, rock fissures, rock ledges, under boulders, and possibly tree holes. Nest sites were often used for considerable periods of time and the accumulated debris of prey remains gives a unique insight into the small vertebrates (including birds, reptiles and bats) in New Zealand ecosystems before human arrival. 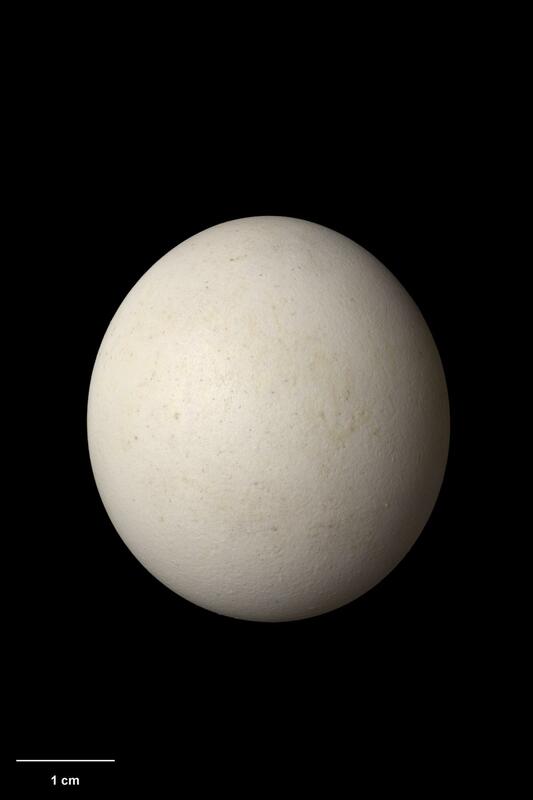 The two white eggs (47 mm x 39 mm) were laid in September-October. Chicks hatched after 25 days and were reared during October-November. The female is thought to have incubated alone, though fed throughout by the male. 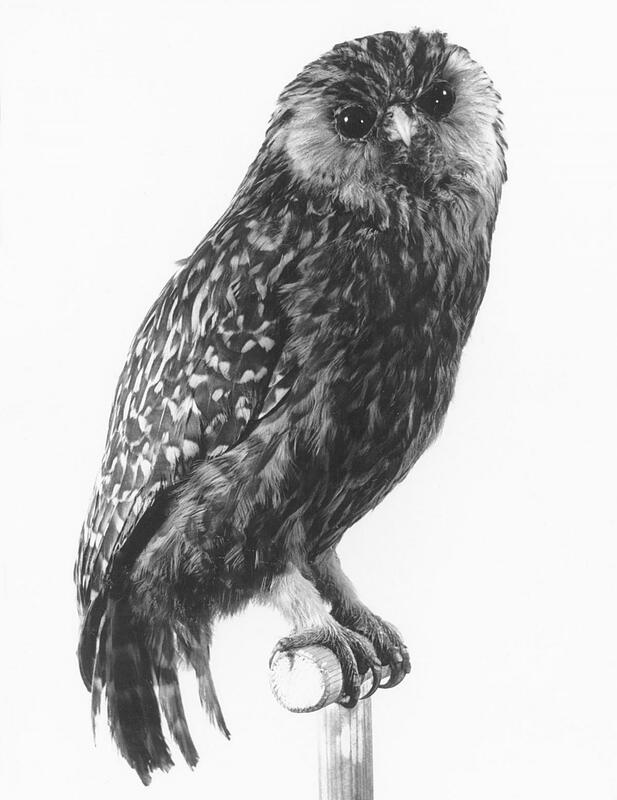 The laughing owl was a nocturnal, generalist predator. Prior to human settlement it fed on small- to medium-sized birds, frogs, bats, lizards, juvenile tuatara, and larger insects. 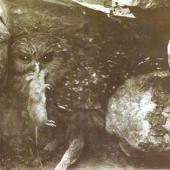 Following Polynesian arrival, and the modification of the South Island east coast environment which resulted in a decline in its traditional prey, the Pacific rat became an important component of the owl’s diet. Gill, B. 1996. Geographical variation in the bone length of laughing owls (Sceloglaux albifacies). Notornis 43: 85-90. Gill, B.J. (Convener). 2010. 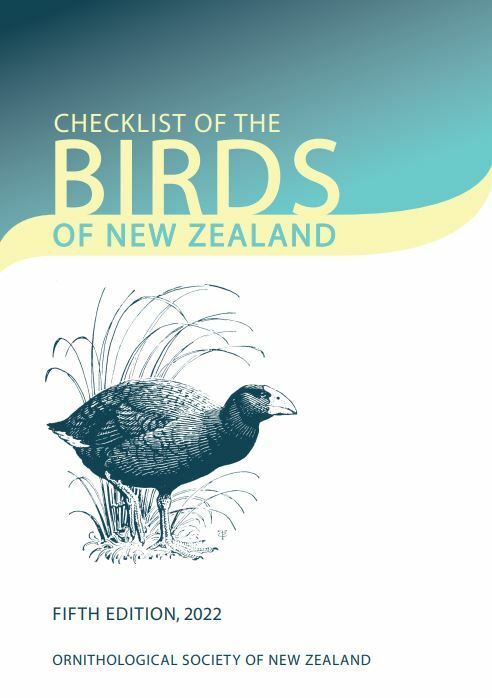 Checklist of the birds of New Zealand. Te Papa Press, Wellington. Gill, B.; Martinson, P. 1991. New Zealand’s extinct birds. Random Century, Auckland. König, C.; Weick, F. 2008. 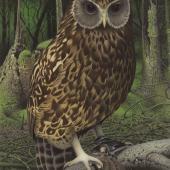 Owls of the world, 2nd edition. Christopher Helm, London. Williams, G.R. ; Harrison, M. 1972. 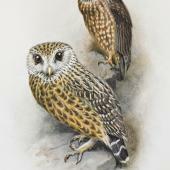 The laughing owl Sceloglaux albifacies. Notornis 19: 4-19. Wood, J.R.; Mitchell, K.J. ; Scofield, R.P. ; De Pietri, V.L. ; Rawlence, N.J.; Cooper, A. 2016. 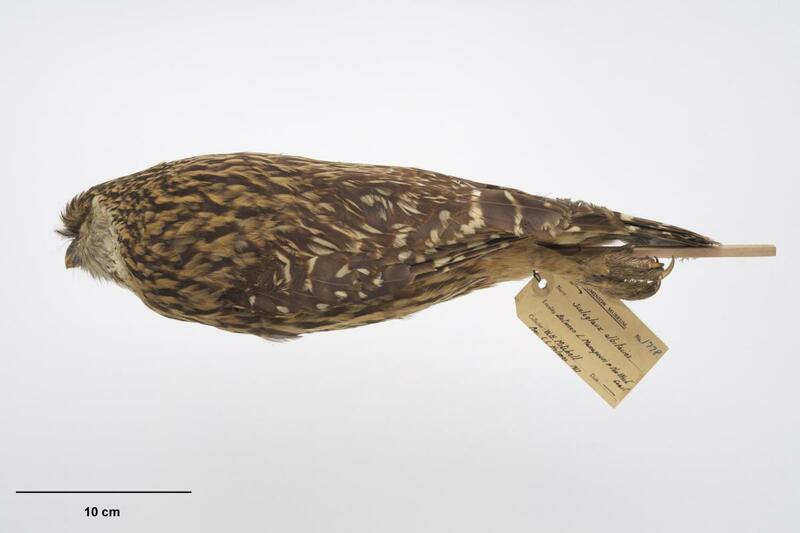 Phylogenetic relationships and terrestrial adaptations of the extinct laughing owl, Sceloglaux albifacies (Aves: Strigidae). Zoological Journal of the Linnean Society179: 907-918. Worthy, T.H. ; Holdaway, R.N. 2002. The lost world of the moa. Indiana University Press, Bloomington and Indianapolis. A large robust dark brown owl with buff-yellow longitudinal feather patterning and yellow eyes and pale facial disks on either side of a sharply hooked yellowish bill. The underparts were yellowish-brown to buff streaked dark brown or reddish-brown, the wings and tail were brown with paler bars, and the legs were covered to the toes with bristly pale feathers.